I noticed a lot of interest in my sprinkler timer review post and I wanted to expand on that a bit. 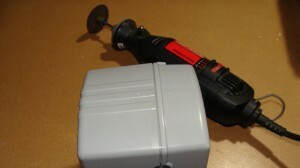 In this post I’ll tear apart the Vigoro 3015V Sprinkler Timer and see what inside of it and makes it work. This timer has worked reliably for me, but I switched to the Orbit multi-zone sprinkler timer system so this unit was spare. I can’t resist opening up stuff and checking it out. Please read through the post and post a comment if you like. 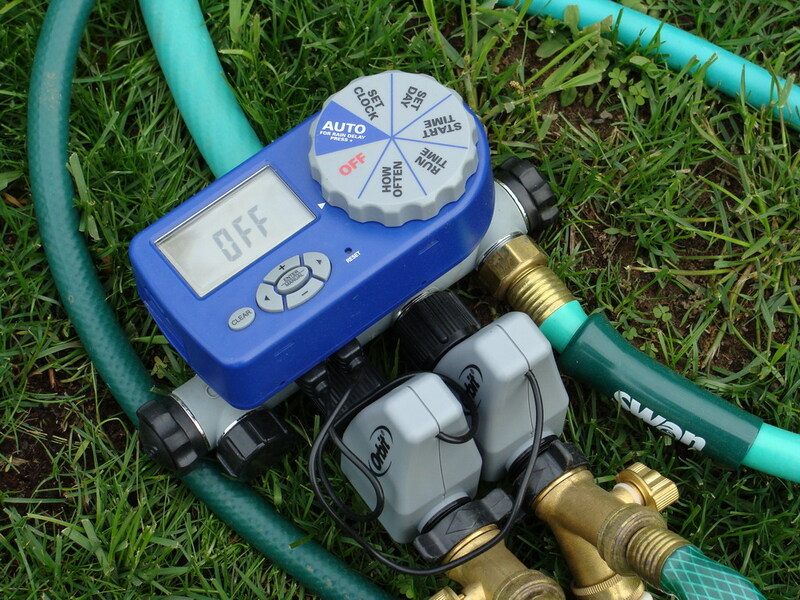 The Vigoro 3015V sprinkler timer is a single-zone outdoor unit which connects directly to your outdoor hose lines and has an option for a remote water sensor unit which is attached to a receiver. The case is glued, or more likely ultrasonically welded closed around the internal components. If you want to see large versions of these images just click on the image in the page you can use the << and >> button at the bottom of the image viewer to move between photos. The first step in opening the case is to pull out my trusty craftsman moto-tool and cut carefully through the seam of the box. I wore safety glasses for this as hot plastic gets thrown all over the place. I didn’t want to cut through the valves or through the plug for the water sensor receiver antenna, so I used a screwdriver just to pop the remaining edges of the seams. It came apart pretty easily. 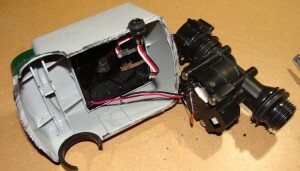 With that done we can now see the internals of the Vigoro 3015V sprinkler timer and get an idea for how they do things. I’ve labeled the different components inside of the housing. 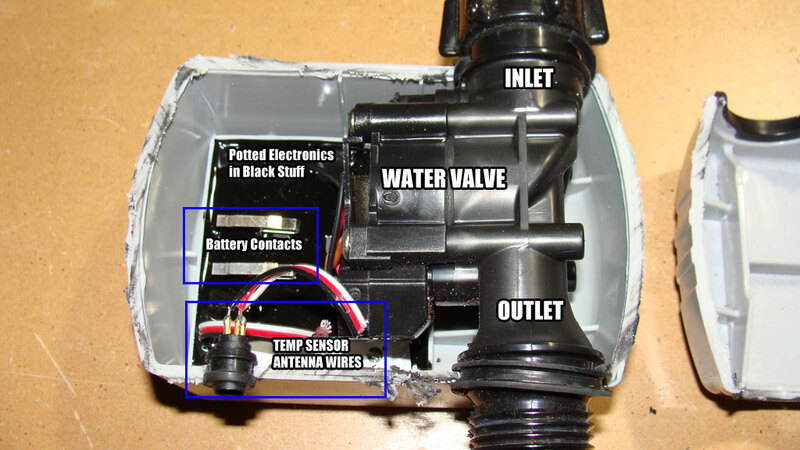 You can see the battery terminals, Rain Sensor Antenna connector (mislabeled as ‘temp sensor’, the water valve and in the bottom of the shell you can see the ‘potted’ electronics section with the battery terminals going into it. The potting materials are usually an epoxy type material which is designed to completely seal the electronics and protect them from any moisture damage. I disconnected the valve assembly for a closer look as seen in this next picture on the right hand side. The valve has a long barrel section which looks something like a rifle scope, and attached to the left hand side with the red and black wires is the drive motor and gearing. Here’s a side view of the valve. You can see the drive motor a bit more clearly as well as the one of the gears that it moves. The gearing moves a pin in and out of the valve housing to start and stop the flow of water. 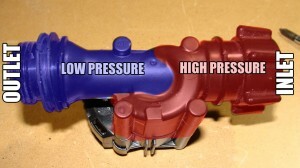 This picture below is the top view of the valve labeled and colored to show the high and low pressure side. 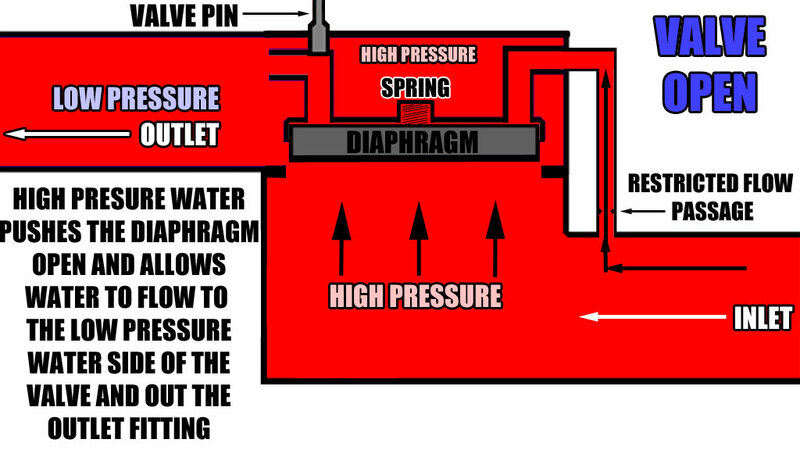 The high pressure side from the water inlet comes in from the right and co-axially surrounds the low pressure section which goes to the outlet. I removed the motor from the valve and you can see a bunch more labels. Of note you can see the high and low pressure taps, and the return spring in the middle. 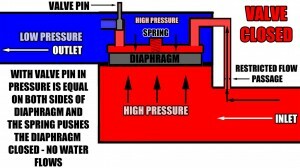 When the pin slides out it connects the high pressure from the high pressure tap to the low pressure tap, causing the main high pressure to compress the spring and open the valve. A more detailed pictorial sequence is further down in this post. 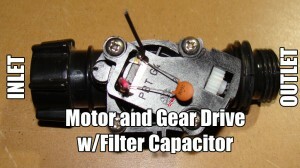 This is the main valve drive motor for the Vigoro 3015V sprinkler timer. 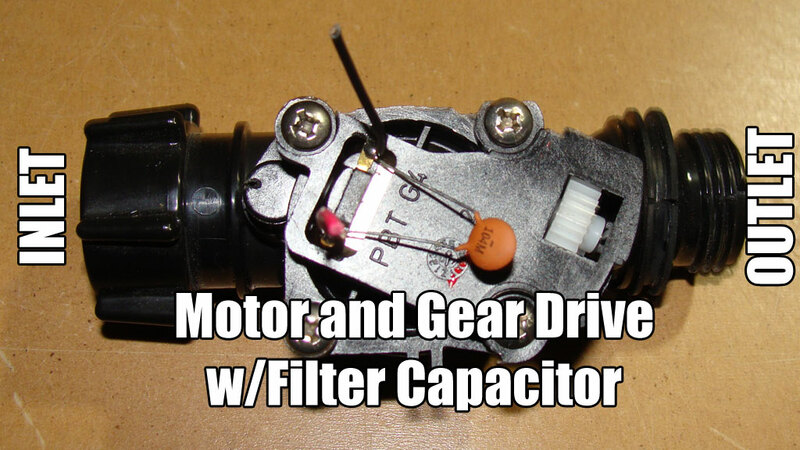 It consists of a small DC motor and a gear drive with a cam on it. as the motor rotates (rather quickly) it presses the pin in, or pulls the pin out. 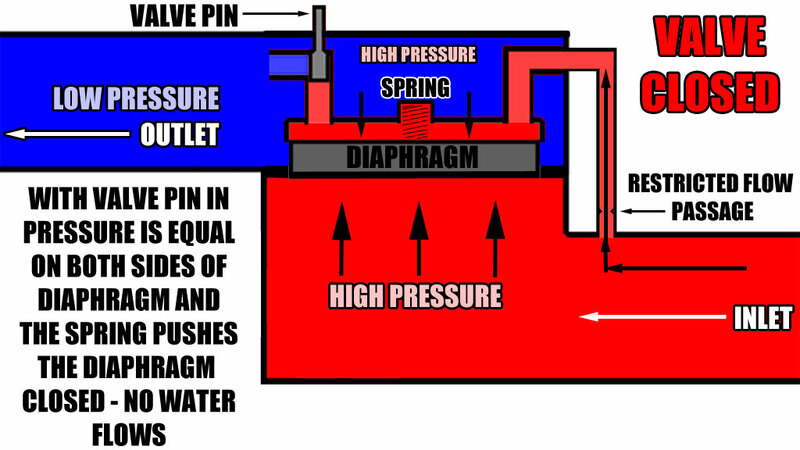 When the pin is extended the pressure behind the valve diaphragm equalizes and the spring forces the diaphragm closed. When the pin slides out, the opposite happens. 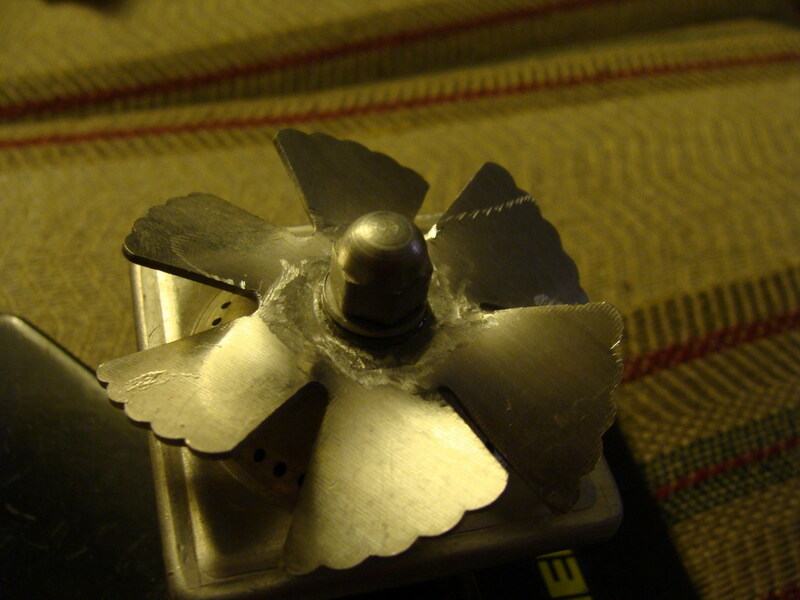 Below is the valve body with the diaphragm removed. 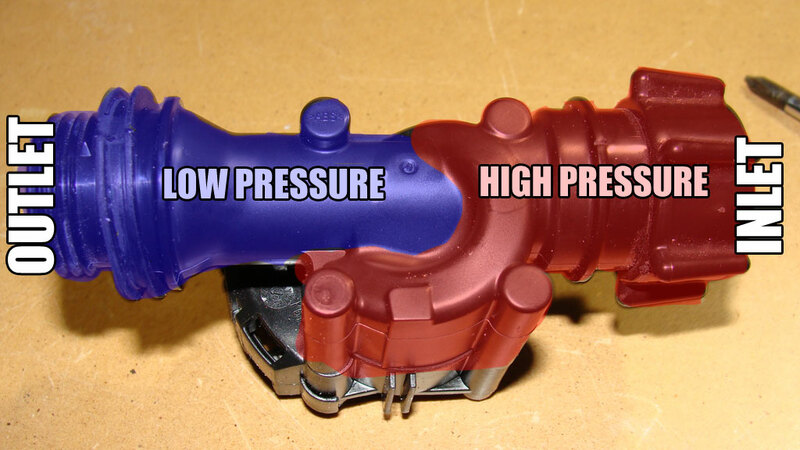 If you look at a large version of the photo you can see how there is an outer cavity where the high pressure water comes in from your home and then an inner cavity which is the low pressure/outlet side of the valve. In the next 3 images you can see a diagram I drew of the valve in the Vigoro 3015V. This is the sequence of the valve opening. Closing the valve works in reverse. 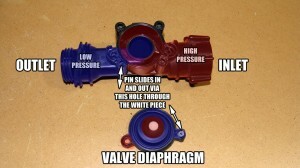 I hope this helps anyone who was curious about how these valves work. There is a gate, but it’s very small and basically acts as a hydraulic switch to operate a larger hydraulically operated valve. It’s kind of neat for me as I’ve always wondered how these things work, and it took me a little bit to figure out how the thing worked. I was expecting to see a large gate with a motor that open and closed it. 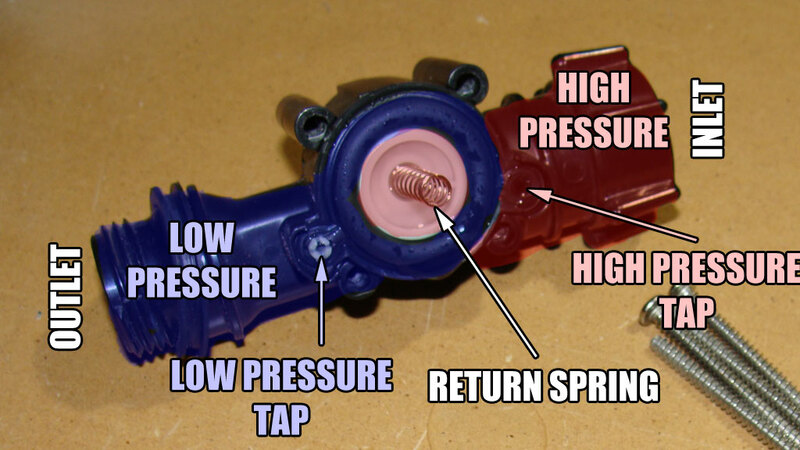 I think the Orbit valves may work like this, and I am going to be dis-assembling one of my spare valves from my Orbit Sprinkler Timer at some point this week. Please let me know if you have any questions or comments or corrections by filling in the comment form at the bottom of the page. Some Options for Sprinkler Timers Sprinkler Modding My Lights Dim When the Toilet Flushes Replace Brakes, Air Filter, Valve Cover Gasket 1987 Honda Accord Chevy Colorado Check Engine Light Problems Driving Me Mad! Jon, Thanks so much for this. You’re quite good at determning how things work, graphical representation, technical description (and tearing things apart!). So, I’m curious: did this unit fail due to blockage of the restricted flow passage, unseating or of the spring, problem in the motor or gear to drive the pin, eclectronics, or…? Hello Ferdinand, thank you for the positive feedback! This unit hadn’t actually failed for me. I replaced it with a Orbit 4 Zone Watering System (The blue one in the other article) and that has been working out great for me. I felt it was worth showing what is inside these devices we trust our lawns and plants to. The Orbit uses the ball valves as well I believe, I am going to ‘open up’ one of the valves to see how it works. The valve I removed from the 3015V is not going to waste however, I will probably re-purpose it for water cooling on one of my laser project (http://www.thaltech.com/laserblog) which I’ve been meaning to get back to work on. In looking at this Vigoro valve, I don’t see a lot that could go wrong from it unless it had an electrical failure. 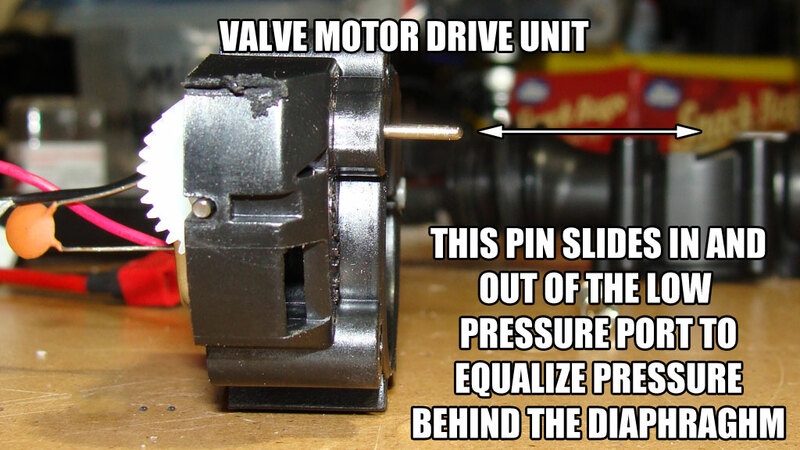 The gears are fairly durable and the fact that it’s only a pin that moves in and out to activate the valve minimize physical stresses just down mostly to that pin. If you find out what has happened with your Vigoro, please post back, I am curious in hearing. Hi Jon C. Thanks for your in-depth description about the Timer. The outflow from my timer is a trickle and not a flow, please advise on what could possibly be my problem. Regards. Hey this is Jon-A (not to be confused with JonC)…. I am trying determine how to interface directly with the Orbit Vigoro valve and open and close it through my own interface. 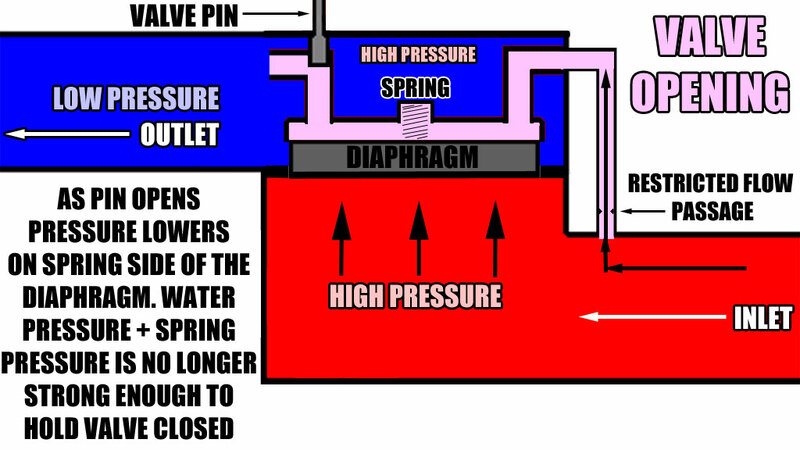 Putting a meter on the timer/controller when it turns those valves on for a duration and then of, it seems to put a certain voltage to open, and then later when it is closing the valve it puts another volatage to the valve. 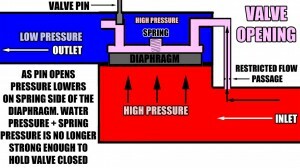 Between the open and close times there is no voltage going to the valve. I can open the valve by puting 3v(from 2 AA batteries), but I am unable to close it without reattaching the valve to the coltroller. Do you have any idea how to open and then close the valve through your own interface. The Orbit Vigoro I have is the 345-179 model. It looks a little bit different than your contolller, but I am hoping the valve interface is the same. Hi there Jon-A, Have you tried to just reverse the voltage to the valve? I think that should solve you problem, if not let me know and when I get home I’ll dig into one of my spare valves and see what’s going on in there for you. Let me know either way, it would be good to hear if you got it working. Is this some kind of micro-controller project you’re working on? I called Orbit and they said to just reverse the polarity. 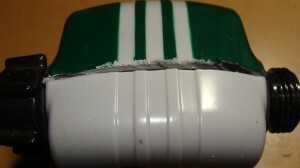 3v DC is the amount they said to use to open it and then just reverse the polarity to close it. The open part works but not the close. I am trying to control this through a parallax basic stamp controller. For now I am just directly making the connections to open it and close it. The close when attached to the timer has a little bit of a delay, but closes just fine. When I open it by applying volts, I have to reattach to controller to close it. Any thoughts or ideas you come up with would be greatly appreciated. Thanks! Does your valve had a stereo headphone type plug? Might be worth cracking the case open (some are glued, some are just snapped together) to get a better idea of how it works. I just spent about 45 minutes pulling apart my system to figure it out. 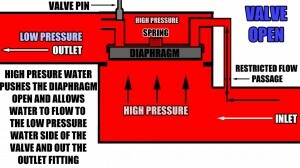 With the system I have, the valves have a gray angular body with a water inlet and outlet. 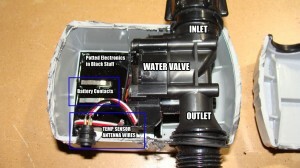 A wire comes from the valve and terminates in an oval shaped end with two pin sockets which connects to the box. The Orbit sprinkler box I have is powered by two 1.5 volt batteries, but internally it has a boost converter which charges a 2200uF/25 volt capacitor to well higher than 3 volts (closer to 12 volts). When you turn the valve on with the control unit, there is a several second delay which is used to charge a capacitor in the control box. This is then switched with a transistor through the solenoid in the valve. When you cancel the program, there is again another few second delay where the capacitor charges, and the transistors switch again, turning the valve off. I would recommend using higher voltages and see if that works for you. You may be able to turn on with a lower voltage, due to the pressure from the water in the line providing some assistance, but not have enough power at 3 volts to force the valve closed against the water pressure. 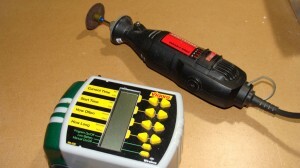 I used a 12 volt power source to successfully open and close the valve repeatedly. 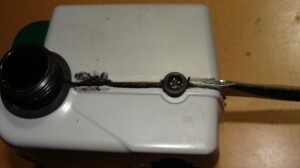 The coil in the solenoid provides quite a bit of kickback voltage when the magnetic field collapses, which will quite likely damage a micro-controller, because you need to trigger it forwards and backwards you can’t use a blocking diode so you’ll need to come up with a creative way to keep the HV spike from getting to the micro-controller. This is also a common problem with relays and micro-controllers. In their circuit it takes 4 transistors, two on each lead, to provide polarity switching on their valve. My valve does not have a stereo plug. Just a two (large Pin) plug. I tried using twelve volts to close the valve with not success. When it opens there is no water or water pressure connected to it. I am currently just trying to open and close the valve stand-alone. I tried the 3volt and 12volt and reversing the polarity on both, with not success. When I hook up to the timer and put a voltmeter on the timer side of the plug I can see the momentary pulse of electricity that closes the vavle back up. Although because it is happening so quick I don’t know the exact amount. So I am wondering if it is a specific amount (of volts/amps) that is sending a specific signal to the valve. It can’t be that complicated that I shouldn’t be able to get this to open and close. One side note is I am going to be requlating air through the valve and not water, but this should be able to do what I need. If I can’t get this to work do you have any ideas/suggestions of another electronic valve that I can open and close with 12volts or less DC? The valve can’t weigh more than maybe 5 ounces at most. I don’t expect you to spend too much time on this, but any quick thoughts is great, otherwise I will go to plan B, what ever that may be. I did have a valve that did what I wanted. It was just controled by a silonoid so when it had power to it the valve was open and when I turned the power off it was closed. This orbit vavle would be better because having the valve open for two house or more doesn’t have any draw on it, so I have better battery life. Thanks for your help so far and again, don’t spend too much time on this, but your thoughts would be great. That’s really confounding for me, I think I’d need to see it in person to figure it out because it doesn’t operate like any I’ve seen before. I put my timer unit on the scope and there was nothing fancy, just a quick spike each time it switched. How much airflow do you need to be able to move through this valve? Do you need a valve with that large of an intake and outlet? You could trying checking out products similar to Clippard Minimatic or STC Valves and also do a Google search for ‘electric pneumatic valves’ or ‘solenoid valves’ to get started then try to find a ‘latching’ type valve so you don’t have to keep your power on all the time. Might even be able to find a useful sponsor on this page for valves, being a valve page and all. This looks like the unit that I have. I am merely trying to change the 9V battery but I cannot get the back off! I have taken out the screws and used a screwdriver but it must be ultrasonically welded as well! Do you have any suggestions? I have almost dug through the casing already & that little door is not budging! The battery cover is kind of a plug with an o-ring around it, it has to come out pretty straight to get it open or the edges will wedge against the case. Be patient and it will come out, just work it back and forth. EXCELLENT! Very well documented description of a Solenoid. Thank you very much for your insight. Diagrams were very helpful! Thank you for the positive comment Jose, I love tearing things apart and I’m glad some other people have the mechanical interest as well. a well documented exploded views.. hats off!! i’ve got three of these, after one year of great service only one is running well and the rest are leaking at the bottom hole.. (same true happens with my neighbor since we bought at the same time)..
need your suggestion on how to fix this leaks, are the two bottom holes are intended for future leaks..
your solution/s is really appreciated..
Hi Freddie, unfortunately if water is leaking out of the housing then the seals on the internal valve have failed or if you’re in a freezing environment and they were not drained of water over the winter the plastic valve housing may have cracked. Unfortunately these do not seem to be built for long term use as I’ve seen complaints of this type of failure on this site. When you compare the valve on these type of sprinkler timers to a valve that is used on a commercial or in-ground home sprinkler system you’ll see that these are much smaller in size. I suspect they are limited to a relatively low number of open/close cycles in comparison to a larger and more durable valve. The larger valves use a higher voltage and higher current power supply to open and close the valves. 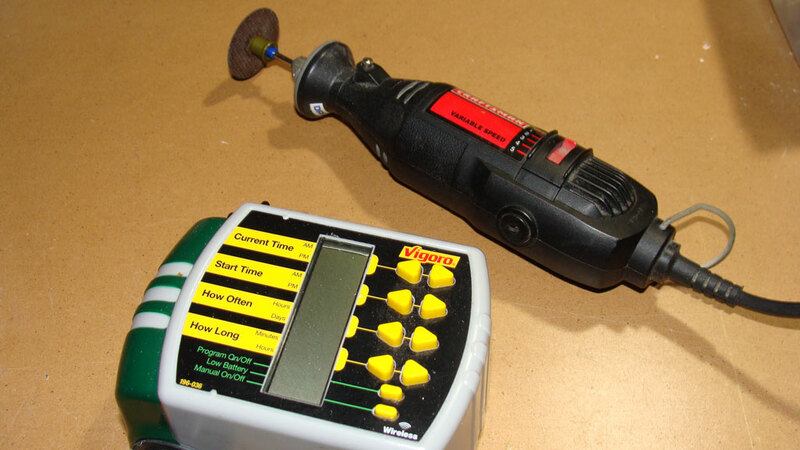 To make a timer this small they downsize the power supply (batteries) and the valve solenoid, as well as the valve to make it work. nice site, JonC, and nice overview of the Vigoro 3015V internals. I can almost smell the burning plastic that started the process. I have this unit and it has a cracked input fitting. 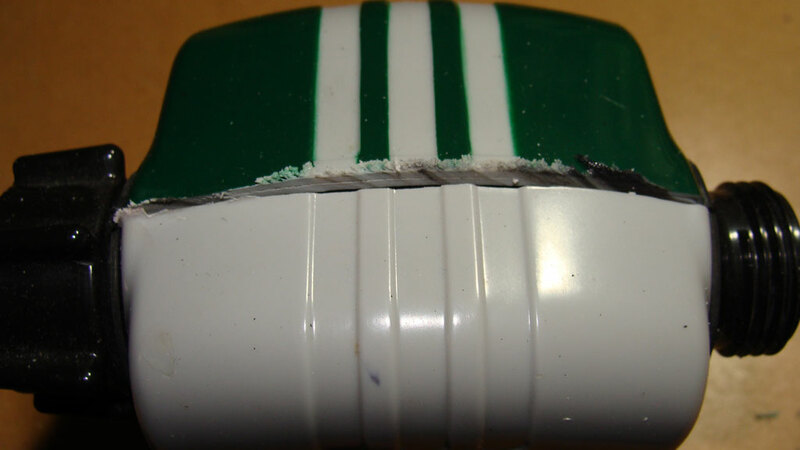 I can’t tell if its replaceable or not from your teardown. Do you know? thanks for getting back to me on this Joe. I guess I’ll get creative! Hey Dave, I have the exact same problem: broken input fitting. What did you come up with? Your post is so wonderful that helped me greatly while I doing my repairing. My Vigoro 3015 had a totally different problem. The location of my hose bibb is bad which resulted in the timer got wet fiarly easy. During our 1 week off time a small amount of water was leaking in on the LCD desplay and I can’t read it any more. After several hours of try I concluded I had to tear the case appart and clear the display surface. Right before I did that I found your post and immediately realized it was not reversible and I won’t be able to seal it back on as good as manufacturer orignally did. I made another approach and patiently “cook” it in oven at 170 F (no and off every 5 minutes to avoid overheating).I am still half way done but I knew it was a better way because I could barely see the numbers now already. Hi George, I’m glad you like the information. If you’re getting low flow, it’s probably worth checking the filter screen on the input side of the timer, if it has one, to make sure it’s not plugged up. If it doesn’t have a filter, try to look down inside the water inflow side and maybe spray some water down in there to rinse it out. Debris from a hose or plumbing work can clog the valve. If you have hard water it’s also possible that there’s some mineral inside, maybe you could find a way to get some CLR scale remover (used for bathrooms, etc) into the valve from both sides and see if any scale buildup gets cleaned out. Due to the way these valves work I’m sure there could be other internal issues which could be causing this as well. Hi – not sure if you are still answering questions about the 3015 timer or not but mine programs fine but when hooked up to the faucet, the water is not controlled and runs continually. Is the timer toast? Hey there, sounds like the valve is toast. It could be either a defect in electronics triggering it to be open all the time, the mechanism could be worn out or maybe there are mineral deposits inside the valve which are not allowing it to close. You could try soaking it and then rinsing it out with CLR to remove the hard water deposits, but other than that it might be time to get a new timer. JonC great website. I used a razor knife and just got mine open. The 9 volt battery was just replaced and the display and all buttons work except the on off bottom button. However I am able to put the 9 volt battery on the terminals and by moving the white gear with my fingers I can sometimes get the pin to move either to close or open the valve. But it is very random not sure what I can do to further diagonize this issue. Any suggestions? Could it be that resistor or capacitor on top of the motor where the red and white wires lead into the selonoid? Or possibily it needs oiled or a new selonoid?